(From Panasonic lens literature) Featuring a focal length from 14mm to 50mm (35mm equivalent: 28mm to 100mm), the new LEICA D VARIO-ELMARIT 14-50mm/f2.8-3.5 lens is the first interchangeable lens from Leica developed exclusively for digital SLR cameras. The "D" signifies that it is designed for the new digital system. The partnership between Leica and Panasonic has resulted in rigorous quality standards for the development and manufacturing of this interchangeable lens, so that the technology and expertise of Leica Camera and Panasonic will be integrated at their highest levels. Both Panasonic and Leica Camera AG are confident that the results of their cooperative efforts will be successful and highly evaluated by customers. The LEICA D VARIO-ELMARIT lens comprises 16 elements in 12 groups, including two aspherical lenses. It provides high definition image rendering that conveys even the finest details and nuances. It minimizes distortion and peripheral vignetting at the wide end. And to draw the best optical performance out of this compact lens, a large-diameter aspherical glass molded lens is also incorporated. With the LEICA D VARIO-ELMARIT, users can now experience the unique performance of Leica optical technology in the world of digital photography. 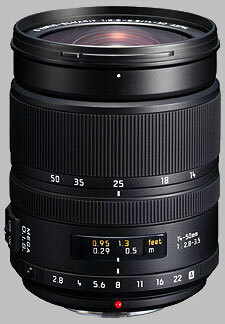 For use in Panasonic's LUMIX cameras, the LEICA D VARIO-ELMARIT 14-50mm/f2.8-3.5 ASPH lens incorporates MEGA O.I.S. Developed entirely by Panasonic, this advanced optical image stabilization system makes it possible - without using a tripod - to capture clear, beautiful images even in macro shooting or low-lit situations, giving users more shooting flexibility. And to assure precise control over the MEGA O.I.S., the Venus Engine is integrated into the lens unit. Together with the full-time Live View function, these two important features make the DMC-L1 (also being introduced) a digital SLR camera that offers an entirely new kind of photographic experience. To improve operating ease, there is an aperture ring in addition to the focus ring and zoom ring, giving users more intuitive aperture adjustment. Another distinctive L1 feature is the shutter speed dial on the camera body. Thanks to features like these, the L1 offers a more comfortable and enjoyable shooting experience than conventional digital SLR cameras. Leica Camera AG and Panasonic affirm their commitment to developing innovative, high-performance lenses that meet the latest demands in today's evolving digital era. This lens in one of the main reasons why I bought a L1. I wanted to start with a bright zoom and this lens does not disappoint. This lens delivers sharp results and it is built very well. The main drawbacks are its compatibility and practicality with the entire Four-Thirds system. Its image stabilization is only a benefit to users of Olympus 400 series or older DSLRs. The size and weight of this lens also makes it a strange fit on those small bodies. Also, only the mode 2 stabilization works on Olympus bodies and the aperture ring is inoperative. Overall this is still a fantastic lens and comes recommended to anyone that wants a bright, quality, and stabilized standard zoom. A very good lens optically. Sharp, vibrant colors. Mega OIS works as advertised, though I'd rather use the IS on the E-3 because the OIS in the lens only provides 2 stops. Its plasticky exterior is a little disappointing considering its price tag and the weather proofing offered by Zuiko counterparts. The lens cap and hood comes off very easily, so you might need a UV filter for this lens. If you've some cash to burn, this lens is priced at USD 900 on B &H / Adorama. So, if you can get a bargain, go for it! This lens will not disappoint.